Covering all major evidentiary doctrines, the text provides a blueprint for introduction of evidence at trial. It enables the student to convert a sentence in the Federal Rules of Evidence into a line of questioning to be used at trial. 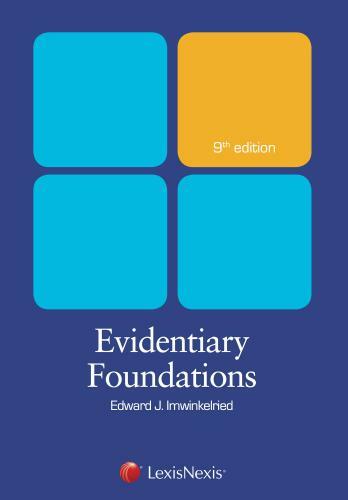 A useful companion to a coursebook in Evidence or Trial Practice, Evidentiary Foundations enables the student to picture the manner in which the rules of evidence operate. After a brief narrative discussion, the book dissects each major evidentiary doctrine into a list of foundational elements. The book then sets out an illustrative foundation, establishing all the predicate elements. This foundation gives the student a more concrete understanding of the evidence rule to which the foundation relates. The Ninth Edition introduces new coverage on topics such as scanned documents, learned treatises, and ancient writings. It also updates the foundations for audiotapes, videotapes, automated surveillance cameras, and the impact of Williams v. Illinois on expert testimony.